Why be Jewish? Strange question, perhaps. After all, if you’re Jewish … you’re Jewish. And yet, the question is not as strange as it once was. 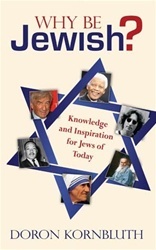 An increasing number of people regard being Jewish – and certainly openly identifying as such – as a lifestyle choice rather than an unchangeable fact. Jewish identity no longer survives automatically. To stay Jewish today, one needs to find his or her own reasons why our heritage is important, inspirational, and relevant. Punchy, upbeat, and full of memorable stories, anecdotes, and jokes, this book is the consummate guide to the beauty and importance of Judaism.